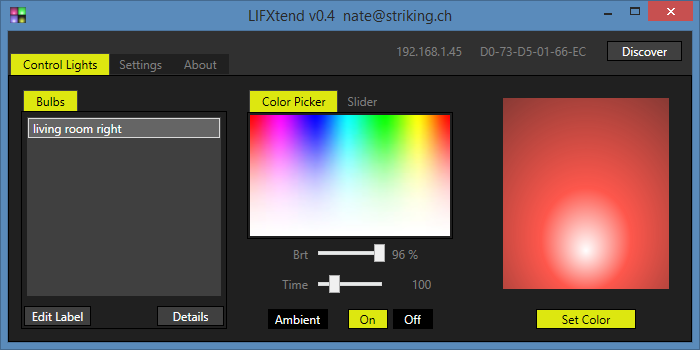 After two weeks of hard work I am happy to release version 0.4 of LIFXtend. NOTE: First install SLIM DX, then run setup (and read the readme). - LIFXtend will now be installed on your computer, and you can uninstall it anytime. New versions will just replace old versions. Congratulations Nate. LIFXtend is really coming along. Well made and easy to use. You should work on the LIFX Android app, because that lacks about everything. Looking forward for even more functionality, like remote (web) control. Nice! Have you tested ambient light for W8? Cannot get it running. I developed it on windows 8.1 64bit, and tested it on some other configurations. If you want to help me troubleshoot the issue, write me an email nate@striking.ch and I will see what I can do. Works very good with winamp and MilkDrop 2 Visualization in desktop mode.